After Will Beckett and Huw Gott had a series of less than successful eateries, they eventually came up with the concept of Hawksmoor, a steak house but very different from the others in the market. Hawksmoor is a meat eater’s paradise but it takes its product very seriously, when looking around for the best steaks it found that the best steaks come from carefully reared native cattle breeds right here in Britain. It was using these producers that have made Hawksmoor’s reputation for quality meat, next they resourced quality seafood. After the success of Hawksmoor Spitalfields , the group has open three other Hawksmoor restaurants Air Street, Guildhall and Seven Dials. Hawksmoor Seven Dials forgoes providing breakfast to concentrate on interesting dishes which play to their strengths. Some examples are Brixham Crab on Toast ,Hawksmoor Smoked Salmon, Half a Native Lobster ,Steak Tartare ,Tamworth Belly Ribs and Bone Marrow with Onions . Steaks can be large, Fillet (300g) Bone-in Sirloin (500g), Rib-eye (400g) 30.00 D-Rump (350g) . 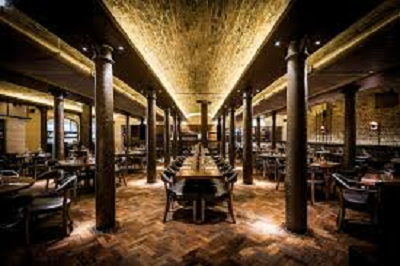 With an enlightened philosophy related to sustainability and staff development , Hawksmoor have built a great reputation for their restaurants and quality of food and service.